In 2014, 37 percent of Amazon’s sales were international, but that number has since declined. Timely access to global trade information, product classification, and landed costs are imperative. 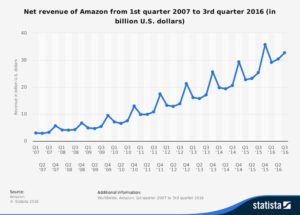 Amazon.com has dominated the ecommerce industry since its humble beginnings in 1995 as an online reseller of books. In its first two months in business, it received orders from customers in all 50 U.S. states and 45 countries with sales up to $20,000 per week. Today, the company offers over 183 million products with newer endeavors like music, groceries, and apparel serving more than 224 million customers. Amazon has an estimated to 65 million U.S. Prime members, more than double what it had two years ago and the product offerings have grown well beyond just books. In 2017, the marketplace’s apparel sales are expected to top Macy’s as the biggest U.S. clothing seller. Then there’s the latest announcement in October about plans to build convenience stores and curbside pickup locations for prepared foods. Incredible growth like this doesn’t come without its ups and downs. In 2014, 37 percent of Amazon’s sales came from international markets but rather than go up, this number has declined in recent years. This has left investors wondering what the market share will be in the future. Amazon admits it’s improperly equipped for crossborder transactions and is diligently working to fix those issues. But the same problems plaguing many ecommerce retailers have worsened, keeping these companies falling short of their capabilities. To prepare for the impending growth through ecommerce channels, retailers must understand their customers’ demand for convenience and remove any obstacles from cross-border commerce. At a recent conference, I was approached by a major footwear manufacturer expressing concerns about B2B shipments into South America because they lack a robust process for import regulation compliance. The obstacles include an ever-changing global trade environment, varying country tariffs, and the accurate classification of products. It’s imperative to maintain timely access to global trade information, master product classification, and comprehensively calculate landed costs at the time of order entry to address these challenges. As ecommerce continues to boom, shipping to customers in more countries complicates the export compliance challenges and increases regulatory risk. Many exporters will struggle to effectively determine license requirements, perform export compliance checks, and generate international trade documents. Manually conducting a search for license requirements, especially those of foreign governments and agencies, can be time consuming. But just as Amazon experienced, running afoul of export regulations can result in significant fines, criminal penalties and potential loss of export privileges. For the fourth time in as many months, U.S. aviation safety regulators have proposed a fine on Amazon.com Inc. for allegedly shipping hazardous materials by aircraft. According to the Federal Aviation Administration, in August 2015, FedEx workers at a sorting facility in Cary, Illinois, discovered a leaking package that held two 14-ounce bottles of a flammable, ethanol-based hair tonic. The FAA alleges that the shipment wasn’t packaged or marked properly to show it contained hazardous material and shipping papers didn’t provide required details, including emergency response information. Early this year, regulators in the U.K. charged Amazon with similar violations including an attempt to ship lithium–ion batteries on passenger aircraft that are barred from carrying the batteries. Automation and trade content is required to ensure compliance. Once identified, exporters have the responsibility to generate and transmit forms to their freight forwarders, customers, and appropriate government authorities, and retain audit history. Whether a global enterprise-sized company or SMB, there are export management solutions that can help. There is clearly a large market opportunity associated with global ecommerce. Companies must address several challenges to make strides and grow through this channel. Retailers, consumer products companies, 3PLs, ecommerce marketplaces, and others need to create a comprehensive plan which includes partnering with a solution provider experienced in global trade regulations and practices. Gary M. Barraco is director, global product marketing at Amber Road.